EpicDuel - Game Design Notes: Azrael Returns! 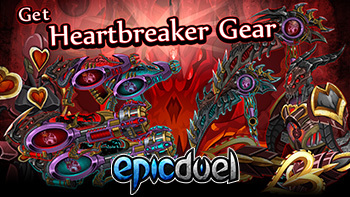 This week in EpicDuel marks the return of classic Azrael/Heartbreaker Gear to Alydroid and Administrator 12 (in the Afterlife)! VendBots across Delta V will also stocked with tons of cores to power up your characters. In addition to this new content, we've also implemented numerous balance adjustments, including skill requirements, NPC skill variety, War balance, and first strike chance. Due to numerous complaints that first strike RNG doesn't favor the player with the most Support enough, with too much weight given to level, we've adjusted the formula to really make those investments in the stat count. When the next war comes online, we're trying something a bit different -- making all the objectives deal standard damage. The currently system allows for one side to create a huge lead, leaving the other demoralized and unable to close the gap. Also, the multiplier for 2v2 war drops was greatly increased, making drops nearly guaranteed for 2v2 wins. I'd like to make bigger, bolder changes to the war system -- and there have been some great ideas proposed -- but I'm not ready to implement anything big yet. Due to the prevalence of botters, particularly in Juggernaut, we've taken a few steps to make life more challenging for these lazy cheaters. We know bots are frustrating, but it's also a challenging offense to prove. Accused botters can claim, "I just didn't feel like talking." or, "I was experimenting with builds." There is also the issue of false accusation made out of spite to challenge rival factions. To try to address this plague, we've implemented a few changes to help discourage and identify botters. Botters rely on predictable NPC behavior so we're buffing multiple NPCs, with a focus on levels 28-35, giving them more defense and skill variety. This means botters may lose more often than not, making them more easily identifiable as a bot. We do have some tools to help identify botting behavior, flagging them for reduced rewards and additional investigation. Eventually, botters get clever and try to get around these, so we've adjusted to guidelines to keep up with these new habits. Obviously, we don't want to reveal everything we do to address bots, since, well, botters could be listening and taking notes. Botter behavior is constantly changing, and we do take it seriously, so we will do our best to adapt as their methods do. Preferably without ruining the user experience for players trying to play legitimately. Hey SPORTS! Check out the new Big Game LIII Achievement available in the achievement shop! NPCs around Delta V have been stocked with some new passive and active cores to power up your character. These new boost cores do stack, so you can mix and match for maximum impact! A large part of my time this month has been devoted to creating wishes for the top 15 winners. So far most of these have been delivered, with a few tweaks here and there. All have been contacted so the last few wishes are nearly finished. As of the writing of this, color separations for the Omega Wolf Warrior Armor Secret Package reward are underway. This should be completed and given to all the Package holders by the end of the day. Thank you all for your patience! Next week should be clearer skies for more content, achievements, and missions!